The Life Gift is now here!! are post on my about page!! This is a clean romance that will make you laugh, cry, and appreciate the small things in life and how precious the gift of life is. I loved every minute of this story. The only thing I didn’t like is that all my favorite characters’ story has to come to an end. So I guess my only option is to reread it! Thanks TR Lykins for another awesome read! 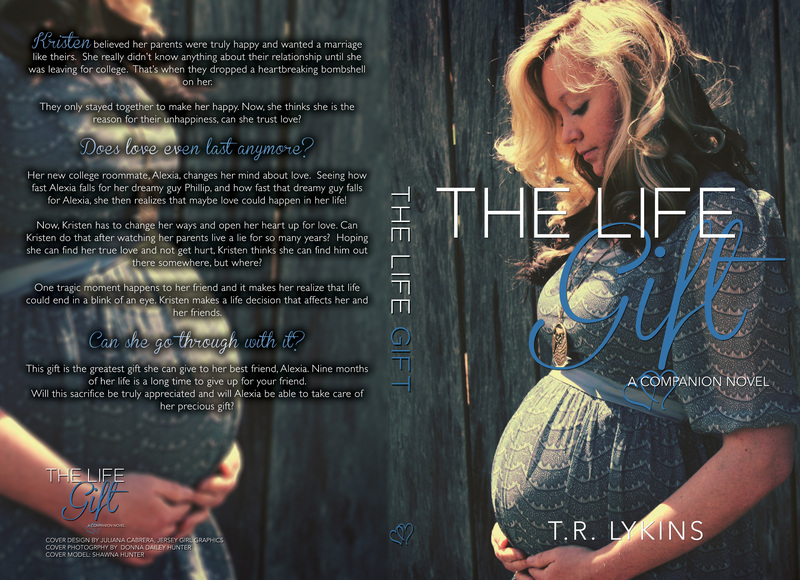 In The Life Gift by TR Lykins we join Alexia’s best friend, Kristen on her journey of falling in love giving her best friends the ultimate gift of life. I don’t even know how to summarize this amazingly touching story without giving it away. All I can is, after The Last Heartbeat (the first book) The Life Gift is an amazing continuation and closing of this story. Kirsten, Jacob, Phillip, Alexia, and Tyler, all college friends, become what can only be described as family. This is a clean, beautiful romance novel that much like the book from with it follows, will leave you inspired, touched and most of all thankful for the little things in life. TR Lykins you have created an amazing world of friends and family in this series and I must say it is one of the most beautiful stories I have read in a long time. Oh. My. Goodness! This book is SO good! I just love these characters—especially the men that Lykins writes about! They LOVE their women! They LOVE their women! Did I mention that they LOVE their women? Plus Lykins shows what true friends do for one another. This book is thought provoking and makes you want to be a better friend and person! After gritting my teeth with her character in Last Heartbeat, I found this story to triumph any conceptions I had formed of her. The Life Gift was inspirational from the first page to the last. You’ll love the events and the reasoning behind Kristen’s choices. An absolute joy to read. Have some tissue in close proximity. 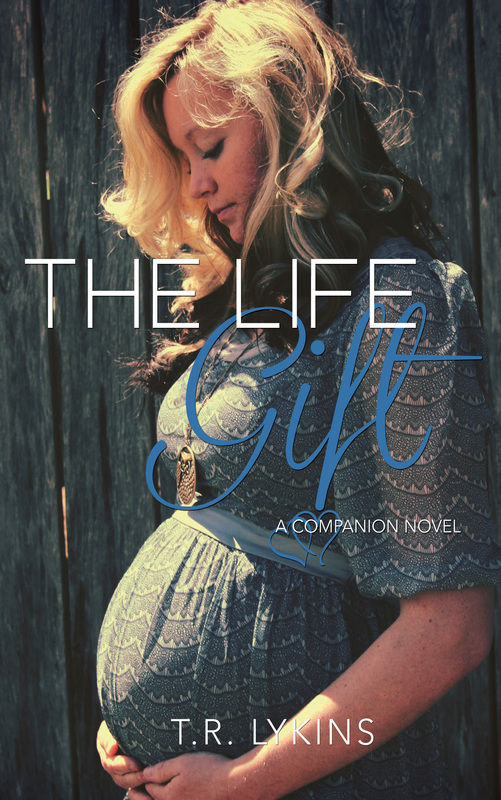 Add The Life Gift to your TBR list click Goodreads now!! Get your ebook copy of Last Heartbeat now!! Get your signed copy of Last Heartbeat now!!! Check out these Goodreads reviews of Last Heartbeat!!! This story is very special to me and really hits home. I gave it 5 stars. One of my friends/coworkers is a organ donor, Bonnie Flexon. She donated her kidney to her sister. Her sister was on dialysis for 1 year before receiving Bonnie’s kidney. The doctors said ideally it would’ve been 3 years before she received a cadaver kidney. Both are doing well and it has been 18 years since their surgery. I hope this story makes you realize how special being a organ donor can be and that you will take the time to consider becoming a donor if you aren’t already. You would be amazed how many lives you can save by allowing your organs to be donated upon your passing. I knew what I wanted to happen from the very start of this book. I was very pleased with the way it turned out. I’m not going to give any spoilers. Alexia is literally on her last heartbeat when she receives a donor heart. She goes to college and falls hard for Phillip. Both of them think they are broken but will another accident make them closer or completely break them both? This book was a gentle read of a love story that takes you to the days of first love and the power to get through anything. Well written and a phenomenal storyline. The Last Heartbeat is well written, kept me interested from beginning to end, and the characters were well developed. Once I started reading, I could not put it down. This story was amazing. It kept me glued from start to finish and I even cried at the end. Well written a true young love, love story. Amesome job to the author and thank you for allowing me a chance to read this book. Started reading & didn’t get a thing done until it was finished! Loved it! I was lucky enough to have a chance to read an advanced copy of Last Heartbeat. I really enjoyed the read. Alexia (Love this name!) and Philip each have a very special story and share an incredibly unique bond. Last Heartbeat is an emotion filled ride, and I enjoyed getting to see both characters points of view throughout the course of the book. I also enjoyed the side characters. Philip’s friends and Alexia’s roommate were great side characters as well. I loved the time that Alexia and Philip spent at the beach, it definitely left me eager to take a trip to the sand! Fantastic debut novel! Little did I realize when I first started this book I would be grabbed ahold of by the author and not let go till the author was finished with me. The characters in this one have alot of depth given to them that brought them to life so vividly especially with the characters alternating with their first person narratives. This is a story that explores love when two people discover each other with all their obstacles how love conquers all. It takes those obstacles and redefines them if the two really want it and grows a relationship that defies time and warms you to the very bones while reading it. Drama begins it and you are whooshed away shortly after to later where you formerly meet Alexia and then also meet Phillip. They meet at school which both are lucky to be there to begin with so they are going for the gold. Icing on the cake for them is meeting each other when neither had any plans of hooking up with someone special. In fact some would say Phillip turns the eyes of many a girl but he will soon only have eyes for Alexia. Both have a secret that they are guarding though from most concerning themselves but both are survivors to say the very least. I would say they are even most fortunate given second chance at life to be lived and loved to the fullest. This author then does that very thing taking me the reader through it all the building of this wonderful relationship between this two. It has care and concern that two should have for each other but Phillip alittle more honest with Alexia about his state then she is. Secrets do have a tendency to surface at the most awful times to create havoc like a bad storm and that is what happens when Phillip learns Alexia has also something different about her but hits close to home thanks to a special gift from his dead brother. Your heart by then has constricted and holding your breath to see if and what will happen with these two who by now love each other dearly. They have the kind that should not be thrown away but could be choked due to fear. You also would like to give Phillip a nudge in the right direction as he drags us the reader through anxiety wondering what is he going to do and is there any hope for these two. That is the wonderful thing about love the kind that is true there is always hope and this author will give it the spectacular star studded ending this novel of these two special characters deserve. I loved the description of this book. However the book was so much better. This book had my jaw dropping at parts that I wasn’t expecting. I guessed early on what was happening. Usually this puts me off a book but with this book it didn’t. It actually made me sit and read this in one sitting. Alexia and Philip are the two main characters. They’ve been through a lot but are they willing to go through more heartache to be together? I’m not gonna give anything away in this review. I just want to say that this is a really great written love story that gave me goosebumps at the end!!! IT”S LIVE ON KINDLE AND PAPERBACK!!!!!! Phillip has lost someone close to him when he was younger. This person was the most important person in his life. He has struggled to get past this loss, and once he does, he finds out something about his favorite person that makes him feel the hurt all over again. Why can’t Phillip move on for good? Can he really forgive someone in the past, if they no longer live? A chance meeting has Alexia and Phillip spending hours talking. This sparks an attraction for each other. Every day, running into each other makes the attraction grow stronger until they finally give in to it. When another accident strikes, both of their pasts come barreling back to haunt them. Can they move forward knowing the secrets they now know about one another? How much more can two broken people endure? Will they find their way back into one another’s arms or have they finally come to a breaking point in life? Happy to visit your world. Love the world you created! Congrats on your release 🙂 Sounds like a promising read! Always love reading new authors! Thanks for the giveaway! Love your book and your world you are the greatest!!!! Jennifer Sivec thinks she’s amazing! So, you asked if we would ever be a surrogate for a friend. Truth is, no, I have not done that already, but only because I am too old now to have anymore children. If the need had arisen when I was younger, I would have agreed to it in a second, as a mom of four children of my own, I always wanted to share that kind of love with other wannabe parents, but my then husband would not have allowed it. I do have a friend who did that for her sister, and it was a weird situation once the baby was born. I gotta wonder how a woman can carry a child, love it, nurture it for the nine months she carries it, and then just walk away from the baby even though she/he goes to a loving family. Not sure I could emotionally detach from the baby unless I never saw the child again. That seems contradictory to my statement above, but I would have done it, and then probably would not have been able to maintain the friendship afterward. Great world you have here! !